Please let us know if you would like to schedule an appointment. We repair your HVAC system. 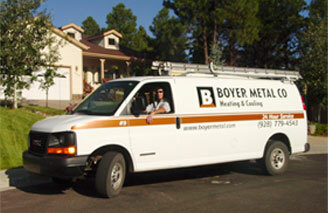 At BOYER HEATING & COOLING we have a distinctive department to handle your service needs. NATE and EPA certified, factory trained technicians are available for emergency service 24 hours a day, seven days a week. Whether you have residential or commercial equipment, we maintain and repair almost all makes and models of equipment. Location, running time, and type of system all affect how often a system will need cleaning. However, no matter how diligently you change your filters, your system should be cleaned at least once a year. What effects do dirty components have on my system? Compressor and/or fan motors run hot, lubrication breaks down and life is shortented. Compressor valves can be damaged due to refrigerant (Freon) flood back. Coil can ice over, stopping all cooling and possibly causing damage due to a condensate water leak. What is the best way to get these cleanings done? You can call us for a maintenance cleaning on your system. You pay whatever regular charges are in effect at the time. Or, you can become one of our Planned Service Agreement (PSA) customers. Let our customer service representatives explain all the benefits, including your savings in operating costs resulting from a clean system. A planned service maintenance agreement allows you to have regularly scheduled precision tuneups, filter changes and check that your HVAC system is running correctly As a Planned Service customer you can expect preferential service, expert maintenance, reduced energy costs and less chance of nuisance breakdowns. If you should experience a breakdown you qualify for 15% off repair parts. Talk to our service dispatcher for the right contract to suit your needs! Just fill out this form if you would like us to contact you about a necessary repair or problem with your heating and/or cooling system or if you would like to start a planned service maintenance agreement. Let us know any helpful information and we will call you back to schedule a service appointment for the issue.